Holidays are over ; How to get back on track !? Holidays are over: How to get back on track and stop procrastinating? I always have mixed feelings after the summer holidays. I hate the fact the holidays are over and I am not looking forward to the busy schedules of work, school, sports and other activities. But I do like to have some more routine again and to get back to fulfilling activities . I often found it hard to pick up “my life” again after the holidays. Before the holiday I used to postpone activities, promising to pick them up when I would be back. During the holidays I would think of many things I was going to do when I was back. But by the time I was back I did not know were to start, and before I knew I was busy with “nothing”. Meaning to say I was busy with things that did not really give me the feeling of fulfillment. My problem was, I did not have enough time to do everything I wanted. So I had to choose. 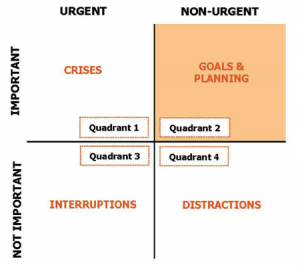 What is important, what is less important, and which of those are urgent which are not? I realized my agenda was full of distractions and of course everyone needs some “distractions “as long as they are important to you and/or give you fulfillment. Then distractions, which are not import should be “eliminated”. For instance, what about the cup of coffee I drank with my friends in the morning? Important to socialize but maybe not every morning, I decided. What about my friends and family visiting us ? I tried to make clear arrangement so I would not accompany them during weekdays. What about all the emails coming in my mailbox when I was working at the computer,? I turned of the “new email alert” and would check my mailbox only after I had finished what I was doing. Making these choices is something you only can do your self but if you have a clear goal in mind you want to achieve it will help you to make the decisions. So I decided if I really wanted to start my own business I should eliminate distractions, set a goal , make a plan and stop procrastinating ! If you need help with any of this or with looking at what kind of business / work you would like to start you can contact me.